Quiet please, just kidding: Walking up Lafayette Street yesterday in NoHo, I spotted this Heineken billboard still clinging to behind-the-scaffolding life from this year’s USO. This spot is just blocks away from the 40 Great Jones, which hosted the Boast party earlier this fall, and the adidas store where I became besties with Justine. Bestines. 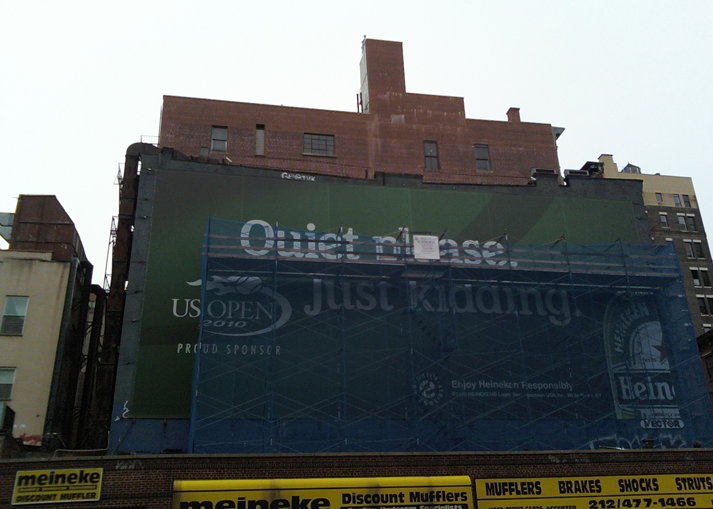 This entry was posted on November 3, 2010 at 7:14 am and is filed under advertising, spotted in the city, U.S. Open. You can follow any responses to this entry through the RSS 2.0 feed. You can leave a response, or trackback from your own site.